Built for landscape shooters, this Sony 16-35mm f/2.8 GM Lens and 82mm Circular Polarizer Filter Kit from B&H pairs an ultra-wide Sony 16-35mm f/2.8 lens for E-mount cameras with a multi-coated circular polarizer filter. The filter can be used to reduce reflections such as in water or glass windows, as well as darken skies and saturate foliage to increase contrast. As for the lens, it offers a bright constant f/2.8 aperture for working in low-light and an 11-blade rounded diaphragm for smooth and soft-edged bokeh. The 82mm NXT Plus Circular Polarizer Filter helps to reduce reflections and glare by filtering out light that has become polarized due to reflection from a non-metallic surface. The light from the sun naturally becomes partially polarized due to reflecting off electrons in air molecules, causing the light to scatter into what appears as haze. A polarizing filter arranges and filters this directionally polarized light perpendicularly to the reflected light, allowing for the absorption of much of this light. This results in a noticeable reduction of glare and reflections from non-metallic surfaces and an increase in the saturation of skies and foliage. This filter is constructed from optical glass for clarity as well as color fidelity and features an aluminum-alloy filter ring that can be rotated in order to adjust the intensity of the polarization effect. To prevent internal ghosting and reflections, each glass surface includes five layers of anti-reflection coating. An additional hydrophobic coating results in an improved beading effect when in contact with water for greater cleaning efficiency. 1.7x filter factor reduces exposure by 0.8 stop. Multicoated to prevent internal ghosting and reflections while providing an improved beading effect with water for more efficient cleaning. Aluminum-alloy filter ring for durability while remaining lightweight. Filter ring can be rotated to adjust the intensity of the polarization effect. 82mm front filter threads allow for use with other filters. Top knurling to provide a more textured grip when mounting or removing it from a lens. Box Dimensions (LxWxH) 8.4 x 5.5 x 5.1"
Box Dimensions (LxWxH) 5.0 x 4.0 x 1.0"
16-35mm f/2.8 GM Lens and 82mm Circular Polarizer Filter Kit is rated 4.8 out of 5 by 67. Rated 5 out of 5 by Eric from WOW ! I'm a real estate photographer so I use wide angle lenses. 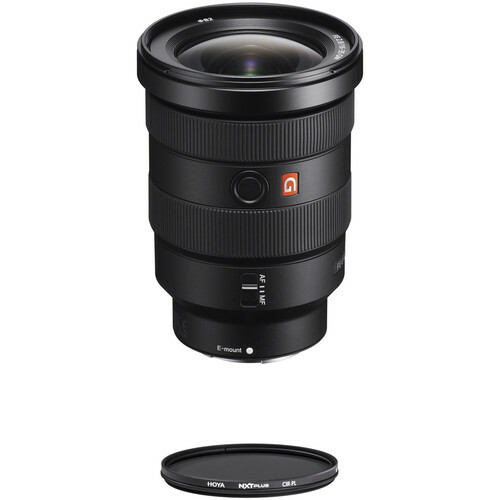 I have the Sony 12-24mm f/4 lens, while it produces good images, they are not great. I've tried the Sony FE 16-35mm f/4 ZA OSS lens but at the widths I shoot the 16-35 was no better than the 12-24mm lens. So, on a whim and relying on great B&H Photo's return policy I ordered the Sony FE 16-35mm f/2.8 GM lens. WOW! What a difference. The images produced are sharp, great contrast and the color is fantastic. I now shoot at f/4.5 instead of f/8 needed on a Sony 12-24mm. I love this lens and B&H you are not getting this one back. Order one from B&H today, if you are not happy with it return it. Rated 5 out of 5 by Sedona Fotopro from A Modern Technological Marvel I'm a fine art outdoor photographer, and have used many different lenses over the past 50+ years. This is one lens that lives up to the hype. It's almost as sharp as the best Zeiss wide angle prime, and at every focal length from 16mm to 35mm. Like all 35mm format lenses, sharpness tails off after f11.0 due to diffraction. But the consistently outstanding clarity and sharpness throughout this zooms' range make this a lens that can match the capabilities of the Sony A7riii camera. And I'm enjoying both immensely. Sony has pulled off a major balancing act with this gem. Rated 5 out of 5 by Barry from Sharper than my 24-70 GM Just picked up this lens. Did my standard check of it on the brick wall of my house at various focal lengths and apertures mounted on my a7r2 on my rrs tripod. Then swapped in my 24-70 2.8 GM to take the same shots in the 24-35mm range without moving the camera and tripod. Brought the images up in Lightroom in compare mode. This lens is so sharp in the corners that it outperforms the 24-70 GM at 24mm and 35mm. (The 24-70 is extremely sharp and I highly recommend it as well.) Corners are sharp even wide open at 2.8. Nice to know I can take my 16-35 GM out for landscape shooting with the knowledge it will be incredible from 16 through 35. That will cover most of my shots allowing me to travel lighter. This is a fantastic lens! Rated 5 out of 5 by Bryan from Great Lens I've had the lens for a few weeks now. Been running it through its paces. Shot a few events (with very difficult lighting) and some landscape. The lens performed perfectly. Just one advise, if you're going to put a UV filter on this, make sure to buy top quality. I bought a medium grade Hoya for it, that cost me over $100, and I find that with the filter on, I get WAY more flares when shooting sunrise and sunsets. Without the filter, I don't see any, even when I try to make it happen. Rated 5 out of 5 by Michael from PHOTOS ALL LOOK LIKE THEY CAME FROM PRIME LENSES Its been about a year and a half since I started using the 16-35mm 2.8 GM. (gave my 16-35mm f4 zeiss to my daughter) I simply had to write this review. Ive now tested it side to side with the new SONY 24mm 1.4 GM and the images are very similar. Its the ONLY zoom lens that delivers the sharpness and BOKEH you would expect from Prime lenses in the f1.4 & f2 world. Yes its not a throw it in your bag anytime lens. It is fairly big and heavy. BUT, man, I really could live on this lens alone for almost everything I shoot for a living. I bought it for location scouting but now use it for everything! Especially gimbal work. . Below are 2 images 1st is from the 24mm 1.4 GM the second is from the SONY 16-35MM 2.8 GM at 24mm zoom. Rated 5 out of 5 by Victor from Worth its Weight I had this lens for about 6 months now. Initially it feel very heavy when fitted with my Sony a7ii. I tested it in taking city-scapes and am pleased with the result, especially on its sharpness all the way to the edge. Recently I lugged it with me on a long hiking trips. l took lots of panoramic photos on mountain massif, down wide and low on rocks and rivers, wide open night sky and even snap shots of people (on 35mm). When those photos were loaded up in Lightroom and PS, they were exceptionally pleasing. Thinking back, the speed and sharpness of this lens is worth lugging around. I usually don't get second chance to do such trips. Rated 5 out of 5 by Mehdi from Beats F4 Sony 16-35 I recently purchased the G-series 16-35 to replace my F4 16-35 and I couldn't be happier. Combined with my a7riii, the lens has been able to do portraits as well as group shots when indoors. My old Sony F4 was great for landscapes and group photos, but if I wanted to take a picture of an individual, it couldnt give the moment that professional grade image like the G-series can. All around better piece of glass with sharper spots in the middle as well as the outer frame. Aside from the size and price, it's a must have for your toolbox. Rated 5 out of 5 by andrew from A7iii with this lens is great! I initially got my a7iii with the sony 35mm 2.8 and it was great. That lens is phenomenal but I wanted a zoom lens with the same distance and went for the 16-35 and im extremely happy i did. i mainly use my camera for vlogs and skits or just story telling and this lens does the job with amazing quality. quick story when I unboxed it, I was in a car at night driving home and my first impression was that I was going to have to raise my iso because I thought the area was too dark.. nope!! the lens did excellent at night and camera performed incredible.. overall, couldnt be happier with the pair. Hi Aj, the FE 16-35mm f/2.8 GM Lens will have a moderate pincushion distortion at 35mm but this can be easily fixed in using post processing software. Does it come with a lens hood? Cant tell from the specs. is there a lock switch on the lens like in the 24-70gm? No, there is no any lock switch in the Sony FE 16-35mm f/2.8 GM lens. just want to make sure this lense is not gray market how can i tell by description? can you focus to infinity with it? Yes, on my copy focusing manually at 15m at 16mm is perfectly focused at infinity. I have the Batis 25 and the Sony Sonnar 55/1.8. I love the sharp, crisp, vibrantly colored images of both those lenses. My question: how does the IQ of this GM lens compare to those? It's definitely sharper then my 55 1.8. I'm my opinion, Sonys best lens to date. Only drawback is the size. What is the best Variable ND filter for this lens? I tried a few 82mm and they cause a bad vignetting. What is the best polarise fikter for this lens? Recommendations please on screw in users and insert in filters like LEE/NiSi/Breakthrough. Thanks! In my opinion, the best CPL filters are HOYA HD. I've had other (incl. B+W), but HOYA has much better coating - which helps cleaning the glass and is not getting dirty very easily.